Not long ago, Downtown practically turned into a ghost town as soon as the Colgate Clock struck 5. Believe it or not, it’s been less than six years since the KFC Yum! Center opened, the east end was dubbed "NuLu," and Downtown began to truly get its groove back. 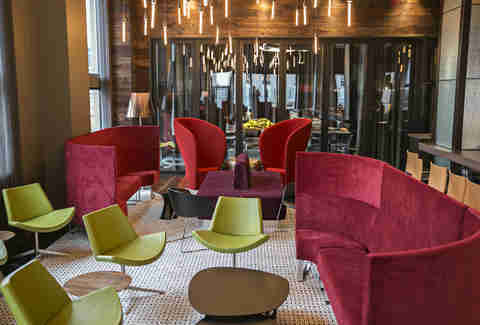 After the recession had its way with the few restaurants brave enough to put down roots in Louisville’s central business district, it felt like all the plans to reestablish the neighborhood as a livable entertainment hub were DOA. Thankfully, they stayed the course, and despite what seemed like impossible odds, they've crafted a thriving cornerstone of our community that is only getting better. One of Downtown’s best assets, of course, is the dining. Alongside a handful of veteran establishments like Vincenzo's, hotel restaurants (we’re lookin’ at you, English Grill, Oakroom, and Proof on Main), and the Mayan Cafe, we have a range of uniquely Louisville bars and restaurants that have put down roots in the heart of Kentucky’s largest city. We’re happy to report that Downtown’s renaissance isn’t just a flash in the pan, and we're just as happy to present our official dining guide to Louisville’s dynamic riverfront neighborhood. If you find yourself on the east end of Downtown in the ever-so-hip NuLu district, you should probably try one of the best burgers in the city (we bow to the signature B&B burger, topped with brie, bacon, and habanero jam). The first dining establishment in chef/restaurateur Ryan Rogers’ ever-growing empire (have you heard about the just-announced plans for Bar Vetti?!) set the tone for the success he’s experienced, and also made evident that this man knows his food. Whether you select the brisket tacos or the baby back pork ribs, an order of loaded tots is non-negotiable. If you’re looking to work Downtown’s weekend brunch circuit, you might want to loosen your belt a notch and take advantage of the locally sourced, Appalachian-inspired offerings of the recently re-opened Hillbilly Tea. This spot serves uniquely Kentucky items like bourbon cured trout salad with bacon candy (just read all those words again, it’s worth it), and skillet pancakes with tea butter. OK, the list of restaurants that could fill this category are slim, but we needed to talk about this relatively unknown spot. Pesto's is small and has all the trappings of a family joint, and regulars are treated like they are just that: family. The menu features traditional preparations of Italian and Persian cuisines, a unique combination that makes for a great change of pace for lunch Monday through Friday, or for dinner, which is only offered on the weekends. 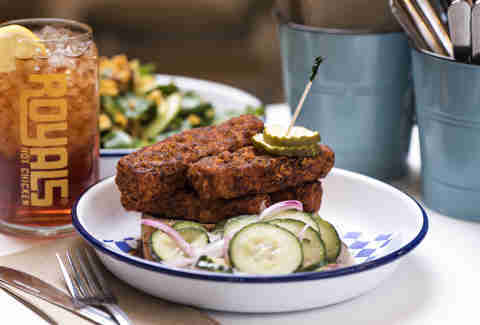 Chef and owner Ryan Rogers has also brought us Royals Hot Chicken, proving you don’t have to be in Nashville to indulge in a fiery fried chicken experience. Here you can order your bird spiced from mild to Gonzo (not for the faint of heart), and served with a side of pimento cheese grits, broccoli & bacon salad, or spicy potato wedges. As your mouth is sure to catch on fire, cool things off with a Royals’ house shake or float. Get your sushi fix with the artful offerings at hiko-A-mon, which offers an array of over 40 rolls, including everyday favorites like spicy tuna, and clever concepts like the Fire Scallop roll, which features spicy crab on the inside with mint leaves, seared scallops, and bonito flakes on top, and the Bluegrass roll, with crab, cucumber, and avocado rolled in a soy wrapper, then topped with spicy tuna and special sauce. And what kind of business district would Downtown be without its share of quality delis? For comforting lunchtime classics, head to The Main Eatery, where a daily "blue plate special" is on offer. If you want a serious treat, stop by on Fridays, when the famous tomato bisque makes an appearance. 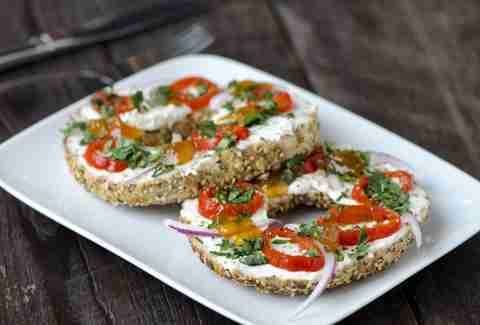 Pair it with a grilled cheese, because that’s simply a good call. Regulars know that there is a certain way to place your order… just let the cashier do the talking! This very necessary spot has the east end/NuLu coffee lovers covered, and it happens to bake up the very best chocolate chip cookie you’ve ever tasted… seriously, they may have made a deal with the devil to get the chocolate chips to stay so melty and chewy. It took no time at all for the craft beer of Against the Grain to win the hearts and taste buds of Louisvillians... and folks throughout the US are starting to fall in love, too. 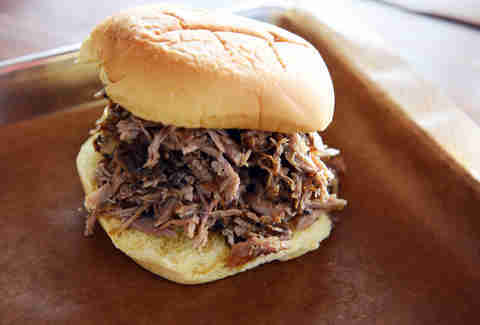 It tastes best at the source, of course, preferably on the brewery's sunny patio, along with some delicious bar grub. This is easily the top can’t-miss dining stop Downtown. The people watching is almost as good as the dry-aged, bone-in rib-eye. A live band croons from atop the bar on most evenings, and the impulse to order a dry martini is real, so you may as well give in. Here’s to hoping you’re using the company credit card during your visit, as the prices are steep, but this is a restaurant where you are meant to splurge. 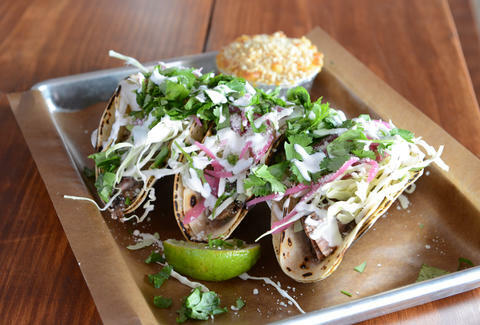 Galaxie’s funky and flavorful take on tacos -- aka wakatakas -- makes this NuLu favorite a delicious lunch or dinner stop, but it’s the signature margaritas that keep us coming back. 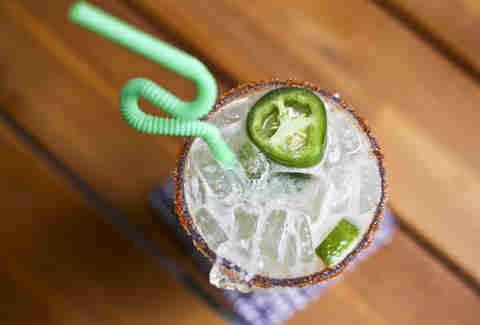 Crafted with Lunazul Blanco, triple sec, and fresh citrus, each drink is made to order, and we highly recommend making yours spicy by adding freshly sliced jalapeño to the mix. Don’t let the fact that Brendon’s Catch 23 is located in an Embassy Suites fool you. The fish is as fresh as it gets, and the menu is chef-driven. The ambiance has a bit of a Vegas vibe, which makes sense, given its close proximity to Fourth Street Live! ; however, the dining experience here is far superior to anything available on Louisville’s tourist strip. Fire pits decorate the sweeping rooftop patio of this 4th St hot spot, ensuring revelers stay warm as the temps begin to drop. A large bar and dining room make up the interior of the space, while floor-to-ceiling windows ensure that the view isn’t compromised, even if guests are dining indoors. Consistently ranked among the best bourbon bars in America, Haymarket has a personality all its own. Live music is on the docket several nights of the week, and the clientele is always a hodgepodge of locals and tourists. Take your pick of over 150 bourbons, and embrace the quirky atmosphere of this Downtown dive. Lindsey McClave is a food, wine, and travel writer who is unlikely to turn down a Galaxie margarita. Follow her food, wine, and travel adventures on Twitter at @FoodieGirlKY.